Rational Team Concert is a part of IBM’s Rational solution for Collaborative Lifecycle Management (CLM). Rational Team Concert facilitates team collaboration and integrates several software development lifecycle tasks, including source control and build management. Rational Developer for Power Systems Software provides a development environment for IBM i, AIX, and Linux applications. Together, Rational Team Concert and Rational Developer for Power Systems Software offer a powerful alternative to developing IBM i applications in a team environment. This article describes the Rational Team Concert build process as it applies to the development of IBM i applications. It also illustrates several Rational Developer for Power Systems Software features and concepts. The main purpose of this article is to introduce Jazz build concepts, IBM i Enterprise build extensions, and general Rational Developer for Power Systems Software functionality, with emphasis on the IBM i Build Specification build style and the new dependency build support that was added to Rational Team Concert version 3.0. The Jazz technology platform is openly developed on jazz.net. Beginning with version 3.0, the Jazz platform is supported by a Jazz Team Server, which is a separate installable web archive that you can use to make other applications, such as the Change and Configuration Management application in Rational Team Concert, work together as a single logical server. Build definition: Defines a build, such as a weekly, project-wide integration build. Build engine: Represents a build system that runs on a dedicated server. Build request: Represents a request to run a build. Build result: Represents the output from a build. The remainder of this article describes how these generic Jazz artifacts apply to building IBM i applications. It also illustrates the Enterprise Extensions of the build definition, build request, and build result artifacts that are specific to the IBM i platform. Access to an equivalent version of the Rational Team Concert server. You can run the server on any supported platform. 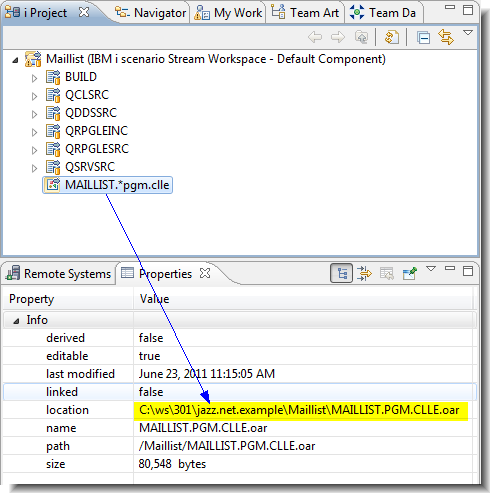 A user ID with a Developer for IBM Enterprise Platforms client access license (CAL). A Rational Build Forge agent running on the same IBM i server where you will run your builds. 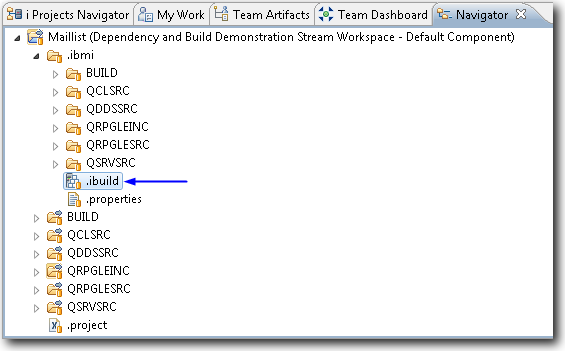 Only one of these build definition types supports dependencies–IBM i Build Specification – Rational Build Agent–and it is the only build template discussed in this article. To configure and work with dependency information, or to use any of the Enterprise Extensions available in Rational Team Concert, your ID requires the Developer for IBM Enterprise Platforms CAL. Rational Developer for Power Systems Software provides an integrated set of application development tools that you can use to edit, compile, and debug applications that target the operating systems (IBM i, AIX, Linux) that run on Power Systems hardware. Together, Rational Developer for Power Systems Software and Rational Team Concert provide a team collaboration solution for application development on the IBM i platform. The i Project is a key concept to developing, sharing, and building IBM i resources. An Eclipse project is a container of resources, organized as folders and files. You can easily share an Eclipse project with Rational Team Concert. An i Project is one type of Eclipse project, so you can also share it to a Rational Team Concert repository. An i Project presents IBM i resources as containers and objects; for example, an IBM i source file is represented by a container of source members. An i Project is associated with one IBM i library and can contain binary objects. Use the i Projects Navigator view to work with your IBM i resources. 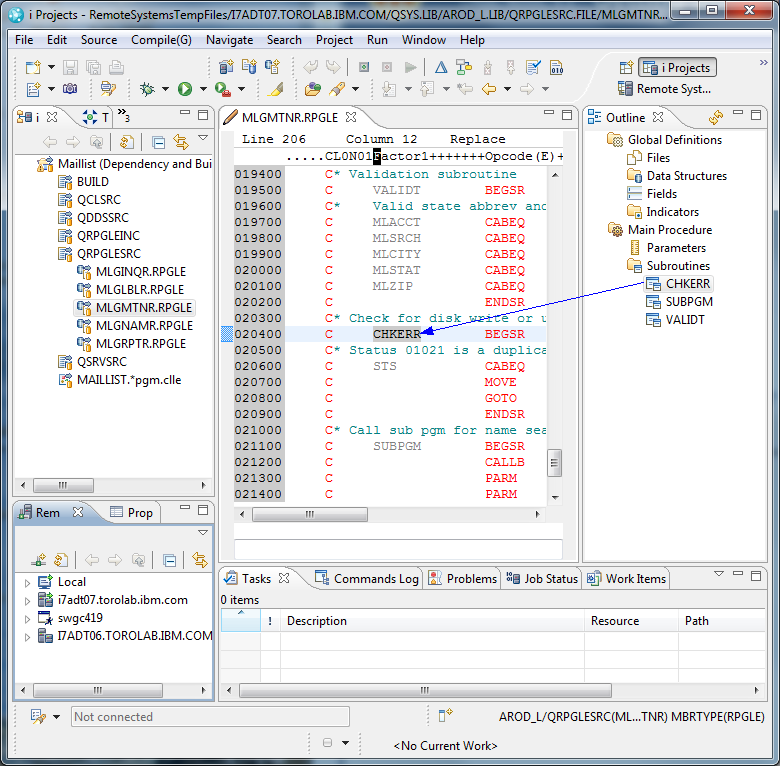 Many of these views are synchronized; for example, if you select an item in the Outline view, the cursor is positioned in the LPEX editor on the corresponding source line, as indicated by the blue arrow above. Object icons in navigator views, such as the i Projects Navigator view, include visual qualifiers; for example, the blue pointer in the upper-right corner of the object icons indicates that the project is remote. The lower-right orange database symbol indicates that the resource is shared in a repository. A yellow background indicates that the resource is out of sync with the repository. Many of these icon qualifiers are common with other types of projects, such as Java projects. There are several related views in the i Projects perspective. This perspective is ideal for working with your source code offline. You can peruse and edit loaded source files when you are away from your workplace, and then deliver the changes to the IBM library or to the repository when you reconnect to your network. 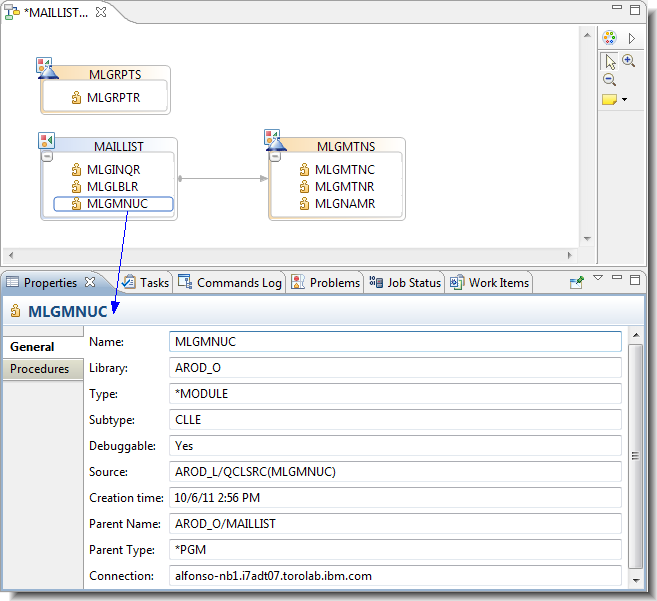 You can even examine selected resources and their call relationships in a Visual Application Diagram, as shown below. Use the i Project Properties dialog to specify a connection, an associated remote library, and a supported build style. An i Project supports four types of build styles, as illustrated below. The default style is Build Specification. An i Project can contain binary objects. When you add a binary object, such as a *PGM, to an i Project, the IBM i object becomes an object archive resource (OAR) file. The progress of this transformation is recorded in the Commands Log view of the i Projects perspective. As shown in figure 3A, the object is first packaged in a *SAVF (save file), then copied to IFS as an OAR file. Figure 3A: Commands performed as a binary object are added to an i Project. After the OAR file is added to the i Project, you can deliver it to the stream. When you select a resource in the i Project view, property values are updated in the Properties view, as shown in figure 3B. Notice that the *PGM resource is stored as an OAR file in the workspace. Figure 3B: Binary resources are stored as OAR files in repositories. Use Project References to select other i Projects, as either prerequisites, or to use their command sets. Variables are string values you can use in command sets or builders. Builders define what output objects you want to build, from which source, and in what order. You can also use builders to specify build dependencies. Command Sets define the commands used to create the output objects. These typically consist of the invocation of IBM i commands that act on source members such as compilers; on other output objects such as in the binding of *MODULES into *PGMs or *SRVPGMs; or that create or modify any other IBM i resources. Build specifications provide a simple abstraction so that you can start building your i Projects with minimal knowledge of underlying build technologies such as Ant or Java. After this introduction, you should be able to open a build specification and be able to identify what it builds, and in what order. When you configure an i Project to use the Build Specification style, you enable the Open Build Specification action. This option is not available if you select another build style. Rational Developer for Power Systems Software includes a build specification editor that ensures that the generated .ibuild XML is correct and properly formatted. 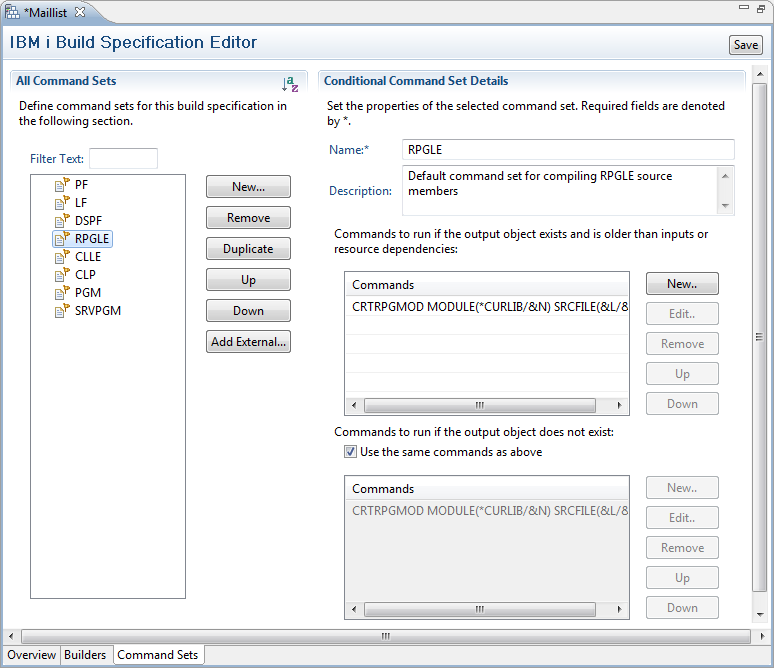 Use this editor to configure your build specifications. Never edit the .ibuild file directly. 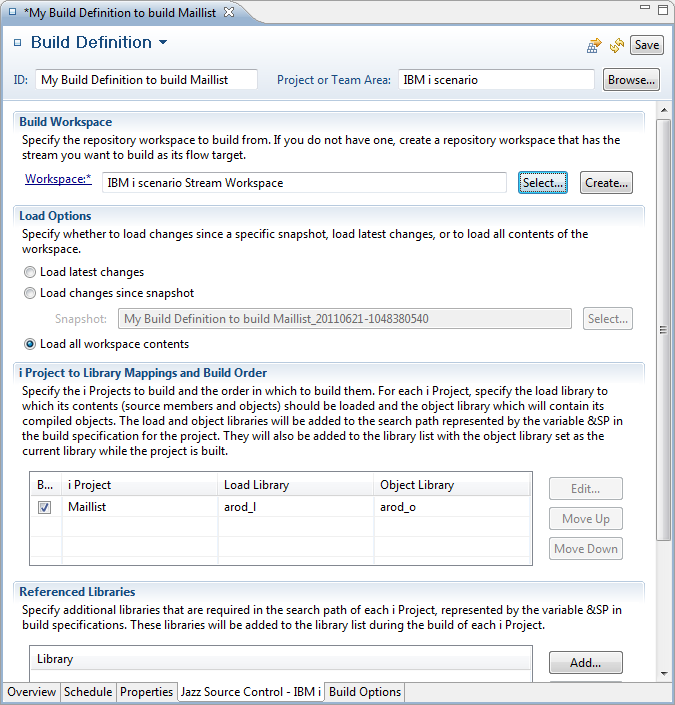 You can open the build specification editor using the Open Build Specification action, or by double-clicking the .ibuild object from the Navigator view. The Build Specification editor is tab-based and consists of three tabs: Use the Overview tab to specify Project References and Project Variables. This tab also provides build specification summary information. You can use the variables defined here in your builders or command sets. Just begin the property name with “&,” as illustrated below. 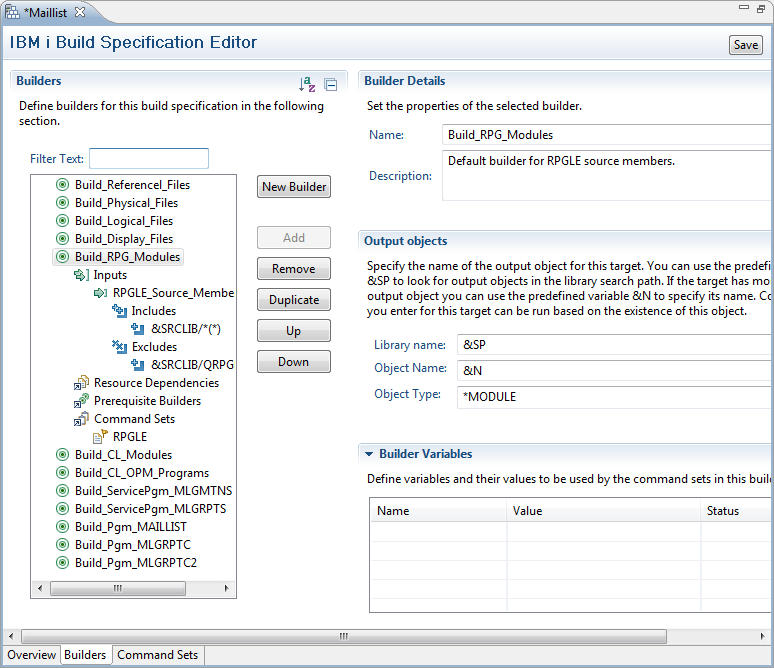 Use the Builders tab to configure the builders in the build specification. You can break down your application build into logical build chunks and implement each as a builder; for example, you can have one builder to compile your RPG source members into *MODULES, individual builders to build your other types of source, and builders to bind *MODULES into *PGMs and *SRVPGMs. When you create a new i Project, a generic build specification is created. It contains a builder for most member types, and a set of supporting command sets. You can base your own build specification from the default build specification, or start from scratch. 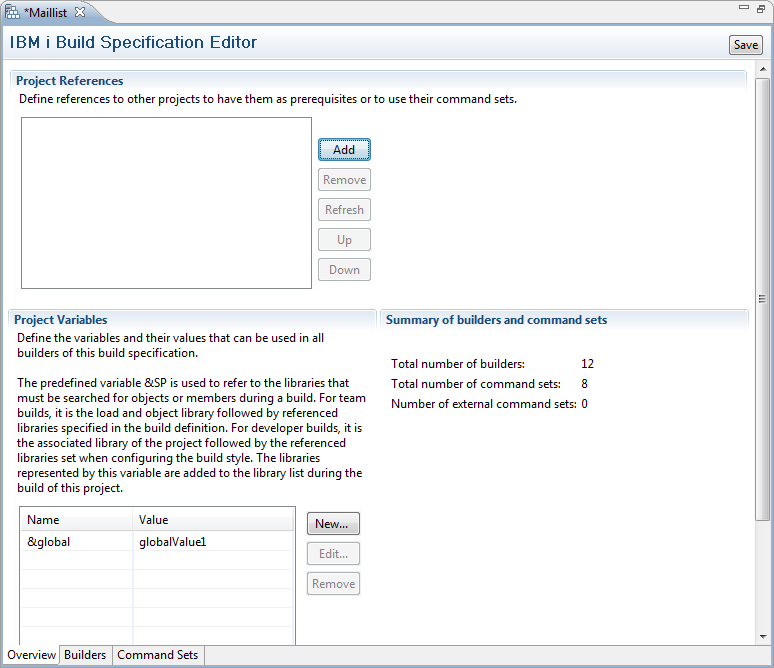 Figure 7 shows the Builders page of the Build Specification editor, with the branches for an RPG builder expanded. In the inputs branch, you can specify include and exclude filters. You can use the resolved build result set as an iterator, wherein the command set is performed on each object, just as you would for compiling source members; or as an aggregate, wherein the command set is performed once for the group, as you would for linking *MODULES into a *PGM or *SRVPGM. You can specify resource (member or object) dependencies. Builders are invoked in the order in which you place them. You can change the order by specifying Prerequisite Builders for each builder. &SRCLIB, which maps at build time to the library you identified as the load library in your build definition. &SP represents a search path. The search path typically consists of the Load library, the Object library, and any other referenced libraries you specified in your build definition. &N is replaced at build time by the name of the source member being processed. There are other special substitution variables: &X : member or object text description. &L: the library that contains the member or object. &F: the file that contains the source member. All the command sets displayed in Figure 8 are locally defined. (They belong to this build specification.) The icon for shared (external) commands is a blue arrow. There are two types of commands: conditional and general. Conditional commands (indicated by a flag icon; e.g., RPGLE) are performed only if the output object does not exist, or is older than the associated input(s). General commands are performed on every invocation (e.g., CLP_Always). Use conditional command sets to specify separate commands to use when you want to create an output object, or when the output object already exists. This section described build specifications. The next section introduces the concept of build definitions. Note the difference between the terms specification and definition. You must create a build definition to submit builds against your i Projects build specifications. You can use the Work Items perspective to configure your build engine and build definitions, run your build definitions, and analyze your build results. You create build engines and build definitions at the project area level, and can work with them from the Team Artifacts view. You must use Rational Build Engine that connects to a build agent running on the build server. 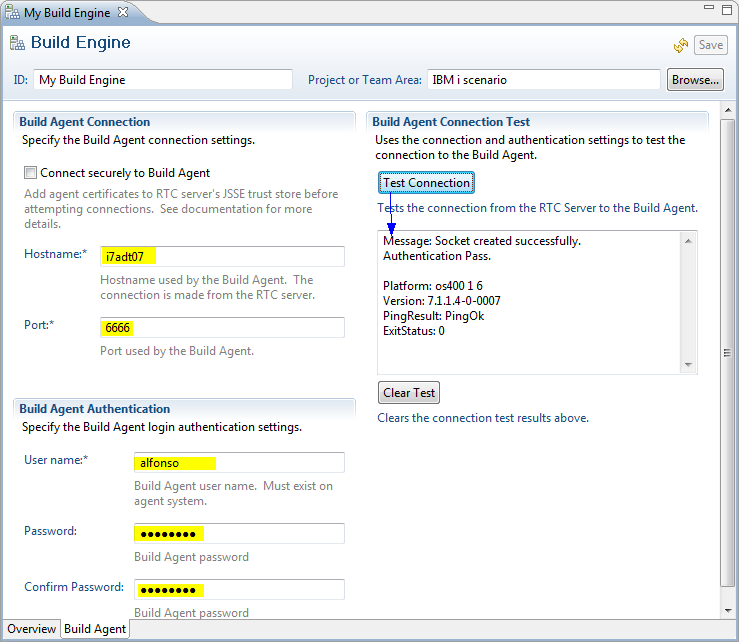 The user name and password you specify in the build engine are used at build time to authenticate to the build server. Click Test Connection to confirm the connection to the build agent. 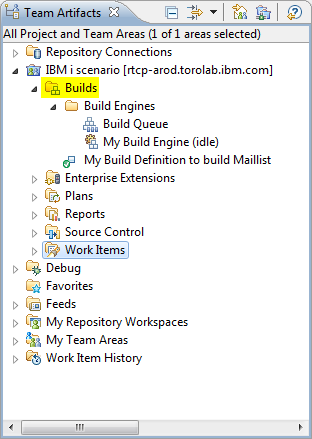 In the Build Workspace section, select the repository workspace to build from. This is a mandatory field. Note: You should use a dedicated build workspace. In the Load Options section, specify what objects to load before starting the build. You can select to perform a complete build (where all i Projects are loaded before the build), or an incremental build, which loads only your most recent changes, or the changes you have made since a snapshot you specify. A snapshot is created after each build. Use the i Project to Library Mappings and Build Order section to select which projects to build, and in what order. Note that selections you make here affect only what gets built, and the build order. Your selections have no effect on what gets loaded. Use the Referenced Libraries section to select which libraries to add to the library list before building each i Project. Use the Build Options tab in the editor to configure the build operation. 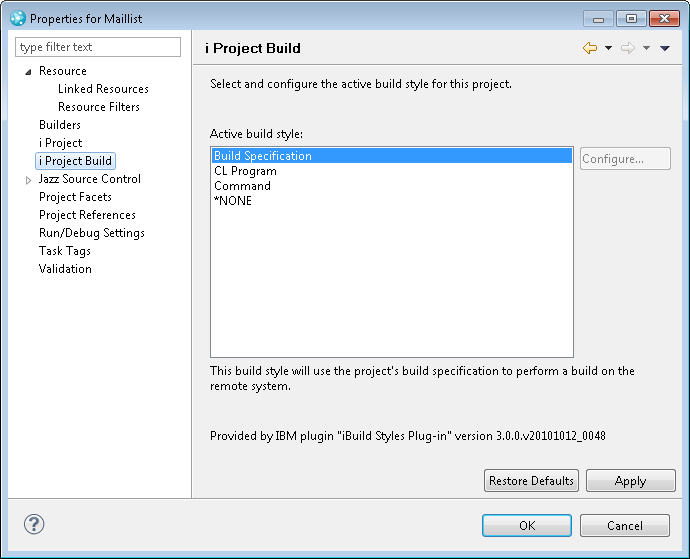 Use the Build Script Information section to configure how to build the i Projects. The default method is to transform the build specification of each i Project into individual Ant scripts via XSLT, and then invoke Ant to run the generated scripts. You can also choose to use your own Ant scripts and build targets instead. Use the Fail on Errors section to specify whether to stop the build if it encounters errors from IBM i commands and compilation actions. The default is to stop for errors of severity 40 and higher. Use the Commands section to indicate IBM i commands to use before and after the i Projects are built. The default is no commands. Use the Ant Configuration section to configure Java and Ant; for example, you can add Ant Arguments, such as “-verbose” or “-debug,” to broaden your log inclusion criteria. You can invoke build definitions from the Team Artifacts view, one of the views available by default on the Work items perspective. To view the invocations performed on a particular build definition, double-click that definition. To open a build result, double-click that build in the Builds view. The Overview tab contains summary information and links to related information. The Activities tab contains execution timing information. Notice that, in the example below, approximately half the time was spent on prebuild tasks, and source code data scanning started after 29 seconds elapsed. The remaining build steps took 27 seconds. The Compilation tab contains compilation results. The Compiles section lists all the compiled members. If you select a source member, all the errors or warnings generated during its compilation are displayed in the Compile output section. The Logs tab contains links to the i Project build logs. The Logs tab can contain links to up to two files. The first is a .xml file called bldrec*.xml that records the built objects. See the sample in listing 1. The second log file that is always generated is called build*.log. It contains messages generated when the Ant scripts run. 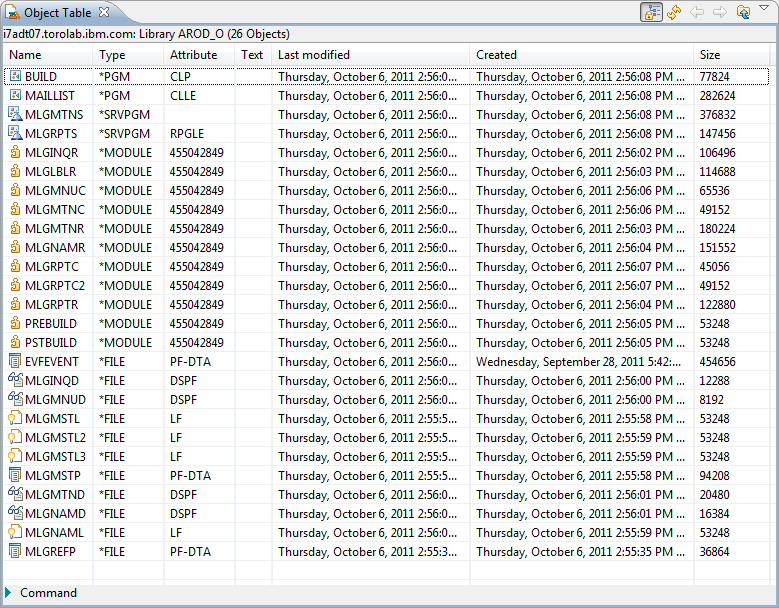 See the sample log file in listing 2. Yes: Always build a user initiated request. AUTH set user account to "alfonso"
SET "com.ibm.teami.build.ant.generated.loadDirectory"="/tmp/rtcp/load/IBM i scenario build"
SET "buildDefinitionId"="My Build Definition to build Maillist"
SCRIPT /QOpenSys/QIBM/ProdData/JavaVM/jdk50/32bit/bin/java -classpath /qibm/home/alfonso/rtc_toolkit/jazz_latest301/jazz/buildsystem/buildengine/eclipse/plugins/org.apache.ant_1.7.1.v20090120-1145/lib/ant-launcher.jar org.apache.tools.ant.launch.Launcher -f /qibm/home/alfonso/rtc_toolkit/jazz_latest301/jazz/buildsystem/buildtoolkit/rtcp_ibmiprebuild.xml -lib /qibm/home/alfonso/rtc_toolkit/jazz_latest301/jazz/buildsystem/buildtoolkit "-Dcom.ibm.teami.build.ant.failOnError=true" "-DbuildLabel=20110627-1531380692" "-DengineUUID=_zvOM8JdfEeC69NrJieKptA" "-Dcom.ibm.teami.build.ant.generated=true" "-Dteami.scm.snapshotUUID=_1H6J46DxEeCezZrRHbi7ZA" "-Dteam.scm.acceptBeforeFetch=false" "-Dteam.scm.workspaceUUID=_PXKvsJa4EeCjDP0DhNDnlQ" "-Dteam.scm.fetchDestination=" "-Dteam.scm.deleteDestinationBeforeFetch=false" "-Dcom.ibm.team.build.internal.engine.template.id=com.ibm.rational.buildforge.buildagent.engine" "-Dteam.scm.clearDestinationBeforeFetch=false" "-DrepositoryAddress=https://rtcp-arod.torolab.ibm.com:9443/ccm/" "-Dteam.scm.componentLoadRules=" "-Dteam.scm.fetchChangesOnly=true" "-DbuildResultUUID=_ERGrsaD0EeCezZrRHbi7ZA" "-Dteam.scm.buildOnlyIfChanges=true" "-Dcom.ibm.teami.build.ant.failOnError.level=40" "-Dcom.ibm.teami.build.ant.generated.loadDirectory=/tmp/rtcp/load/IBM i scenario build" "-Dcom.ibm.teami.build.ant.icmd.failOnError=true" "-DrequestUUID=_ERGrsKD0EeCezZrRHbi7ZA" "-DbuildDefinitionId=My Build Definition to build Maillist" "-Dcom.ibm.team.build.internal.engine.monitoring.threshold=3" "-Dcom.ibm.teami.build.ant.icmd.failOnError.level=40" "-Dcom.ibm.team.build.internal.template.id=com.ibm.teami.build.ant" "-DbuildRequesterUserId=DEV01"
* [ibmiPreBuild] 2011-06-27 15:30:46 [IBM i Jazz Source Control Build Participant] CRCQP3637I: Commands will run in job "094414/QUSER/QZRCSRVS" on host "I7ADT07.TOROLAB.IBM.COM". * [ibmiPreBuild] 2011-06-27 15:30:47 [IBM i File System Agent] CRCQP5022I: Sequence numbers start at "100" and increment by "100"
*    [ibuild] The existing output object is up-to-date. No need to build. *    [ibuild] The existing output object is out-of-date. Need to build. The Java and Ant property values that were applied when the Ant scripts were invoked. Search for a string called “* Buildfile:” in the log file to discover which Ant scripts were invoked. You should find two Ant script instances in the provided build log: one for the invocation of the standard rtcp_ibmiprebuild.xml Ant script, and the second for the invocation of the master.xml Ant script which, in turn, invokes each of the i Project build scripts. The first Ant script instance documents the execution of the prebuild tasks (rtcp_ibmiprebuild.xml) that include loading resources from the repository. It should include an entry for each loaded resource. The second instance documents the build specification scripts that ran for each of the built i Projects (master.xml). It should include information on each builder, and on each command. Look for lines preceded by “[IAntTaskUtils] Command to run:” to find each of the remote commands that ran during the build. You can also examine the build results with the Remote System Explorer perspective. The Audit Report view (see Figure 13) is scoped to a library. You can use it to display the built object signatures. The build specification build process tags each new or modified object with a signature that is unique to the build repository snapshot. The signature is stored in the Attribute field that you define, and it is available on every IBM i object. To display the audit report on a library, find that library in the Remote Systems view, right-click it, and select Show Audit Report. 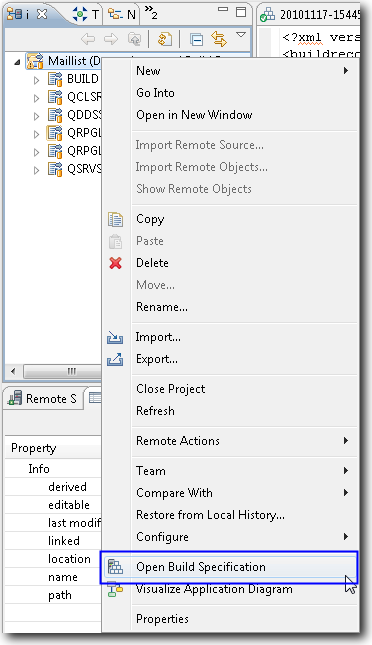 The Object Table view is another view in the Remote System Explorer perspective. Use it to work with built objects. You can modify the contents of this view by selecting columns to display. Click on the column title to change their order. 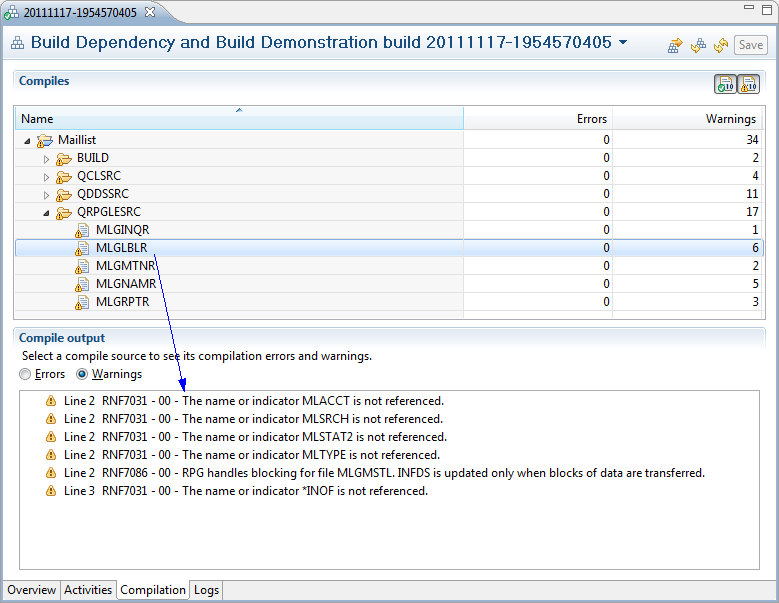 Dependency builds for IBM i applications are supported only by the Build Specification build style. 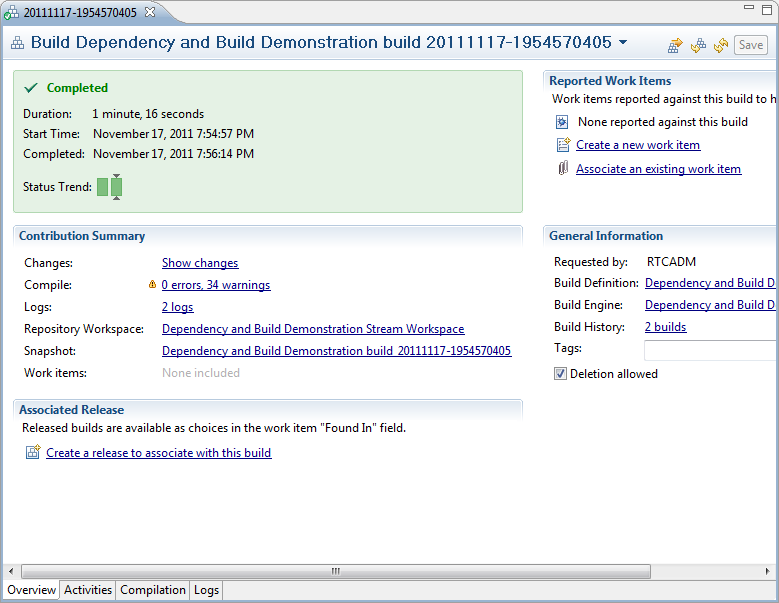 Build support for dependency information is implemented as a seamless extension of the build specification. At build time, all explicit dependencies identified in your build specifications are checked first. Only when these checks fail is the collected dependency information used. Dependency checks are strictly timestamp-based: A resource requires a rebuild when it does not exist, when it is older than any of the source or object dependencies specified in the build specification, or when it is older than any of the dependencies collected by the source code scanners. 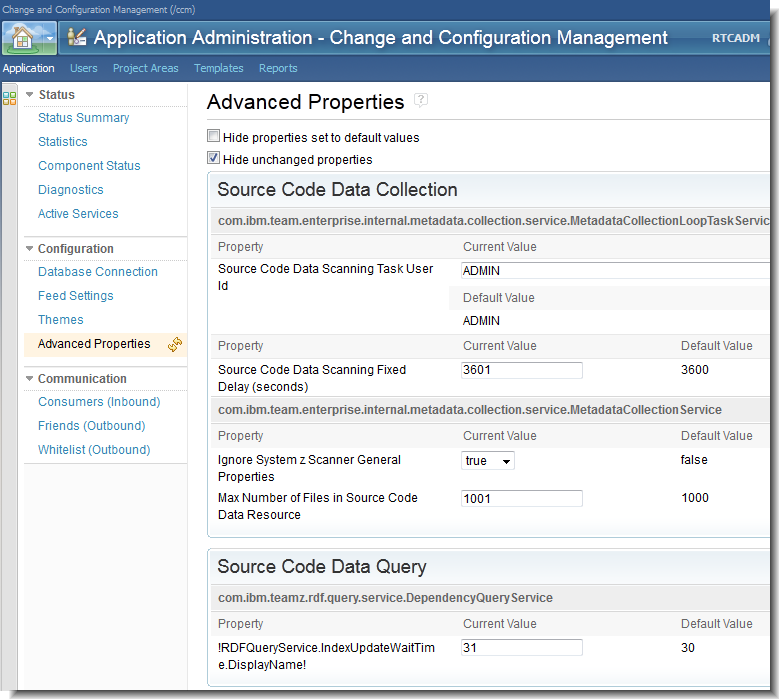 Dependency builds rely on data collected by the source code data collection service in the Rational Team Concert server. Rational Team Concert Enterprise Extensions provides several source scanners, but of these, only two are applicable to the IBM i platform: one for the RPG language and one for the Cobol language. The scanners support both the ILE and the OPM programming models. The source code data collection service stores the dependency data in source code data that is scoped to a stream. The dependencies are logical, and they are resolved into physical dependencies only at build time. By default, nothing is scanned. You must manually select which streams to scan. Use the Source Code Data branch under Enterprise Extensions in the Team Artifacts view to control and monitor data scanning on your streams. 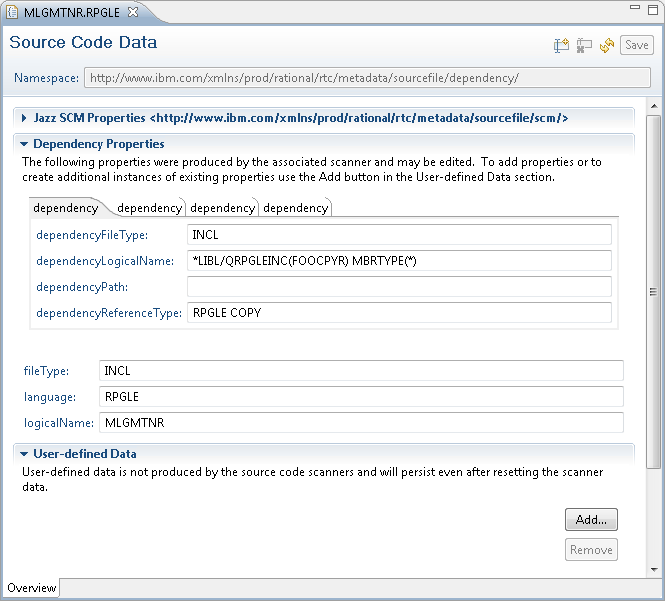 The following screen capture illustrates the source code data actions available. You can use them to select which streams to scan, to manually update or reset scanned information, or to create queries. You can search source code data for two-way dependencies, which means that an object either depends on the selected resource, or the selected resource depends on certain objects. To search for dependencies, locate the member of interest in the i Projects or Navigator view and select Enterprise Extension -> Impact Analysis…. The results are displayed in the Source Code Data view, as shown in the following image. Notice that the information line in the view summarizes the result and type of your impact analysis. Sometimes source code scanning misses some of the dependencies in your code. If this happens, you can edit the source code data with the Source Code Data editor. Your changes in the User-defined Data section are maintained across rebuilds and source code data resets. 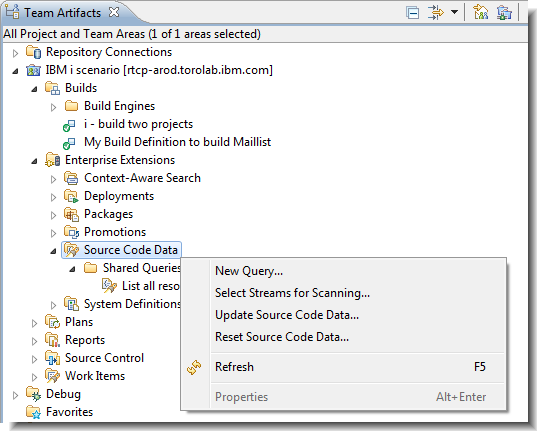 The use of source code data during build specification builds is enabled by default. To disable it, in your build definition, set the ibuild.useautodeps property to false. Special permissions are required to work with source code data. Use the Process Configuration tab in the Project Area editor to configure these permissions. The objective of this article was to show how Rational Team Concert and Rational Developer for Power Systems Software provide an environment for the development of IBM i applications in a collaborative team environment, with emphasis on the build process. The Jazz build system provides a comprehensive build infrastructure through a set of build artifacts: the build engine, the build definition, the build request, and the build result. This article provided a basic introduction to these artifacts and described the enhancements available as Enterprise Extensions to support the building of IBM i applications. To develop IBM i applications efficiently, several Rational Developer for Power Systems Software features and concepts were illustrated, including the i Project, the i Project perspective, and the build specification. Several views in the i Projects and the Remote System Explorer perspectives, which are available to help you develop IBM i applications, were also discussed.